Divided We Fall Map of the U.S. Commonly the liberals and the media blame the right wing supporters of President Trump and present them as redneck crazies. 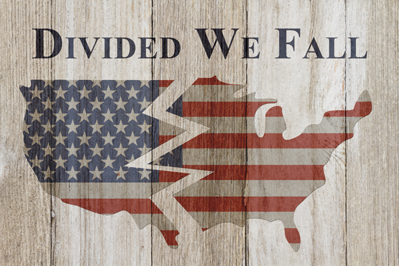 However, there is evidence that the left has played a major part in creating or exacerbating differences in America, according to criminal justice expert Paul Brakke, who has written the forthcoming book Fractured America as a follow-up to the Great National Divides. In the book he has looked closely at the many divisions and how they came to be. Besides his own observations, he points to a seminal article published in a British publication, of all things, "How America's Identity Politics Went from Inclusion to Division" by Amy Chua in a March 2018 issue of The Guardian. These are some of Brakke's key explanations for how identity politics in America changed from urging inclusion to promoting division. Then he recommends some fixes. First, Brakke points to the declining population of white Americans. While minority concerns about discrimination have been highlighted and shamed in the media, any protests by white Americans who are becoming a minority are met with charges of racism and white nationalism. Yet white Americans feel a tremendous loss of power because of what they feel is an influx of immigrants. At the same time, the higher birth rate among Latin Americans and blacks has decreased their relative percentage of the population. In fact, in her article, Chua cites a 2012 study which showed that more than half of white Americans believed that whites have become the primary victims of discrimination, rather than blacks. Under the circumstances, as a threatened group, many white Americans have felt mistreated and disrespected and have retreated into what social scientists call "tribalism", so they have "become more insular, more defensive, more punitive, more us-versus-them," to cite Chua. However, liberals and the media don't recognize this growing fear whites have of being eclipsed by other groups. Rather liberals and the media react to any white protests with derision, feeling their claims are unjustified, at a time when other minority group members feel they are individually and as a group being attacked. And it is true -- there are growing hate crimes and protests against Jews, Muslim, Latinos, gays, transgendered individuals, and others. But while these individuals and groups are embraced as victims by the media and liberals, any whites who come together to call attention to their own grievances are treated as attackers and labeled as "fascists" and "Nazis," which are terms associated with evil. Plus they are called "nationalists" and "white supremacists," who are considered evil, too, even when they are white. Brakke also points out how Martin Luther King's ideal that all individuals should be "guaranteed the unalienable rights of life, liberty, and the pursuit of happiness", expressed in his famous "I have a dream" speech, was transformed. Initially his ideal was supposed to represent a call for universal human rights, based on the dignity of each individual providing the basis for a "just international order." So initially, the Left was especially concerned with the way minorities and disadvantaged groups were oppressed and denied rights, and they promoted the ideal of being blind to group differences. The ideal was bringing everyone together, regardless of ethnicity, race or gender, even when they are white. But after the Soviet Union collapsed, the Left shifted from being concerned with an unjust capitalist system to recognizing group differences and discrimination. Or to cite Chua's article, "the politics of redistribution was replaced by a 'politics of recognition.' Modern identity politics was born." According to Brakke, this shift in the Left's attitude was the turning point which led the way to singling out and demonizing white Americans. As Brakke points out, "Now, based on identity politics, the Left sought recognition for the demands of specific groups that were denied this, such as women, blacks, lesbians. The goal was to get respect for each individual as different, rather than to gain respect in spite of one's differences or to gain inclusion as part of universal humankind." At the same time, Brakke notes, the Left did not grant the same kind of recognition or respect to white Americans. Also, the Left claimed that anyone who tried to deny this recognition of the demands of different groups was guilty of group blindness or oppression of others. "Unfortunately," says Brakke, "this whole process of identity politics has resulted in more and more subdivisions of groups seeking recognition. And it's crazy. Facebook, for example, invites users to choose from over 50 gender designations, which include a variety of new terms to choose from, such as intersex and genderqueer." Moreover, Brakke complains, this emphasis on group identity means that individuals cannot even adopt the dress or ideas of other groups. "For instance, a white male who opens a restaurant serving Mexican food could be accused of appropriating that culture, rather than showing an appreciation for it." What Brakke objects to is the way the Left throws accusations around and ultimately presents the white American male and secondarily the white American female as the oppressor. Thus, any time whites have grievances, these are considered illegitimate or mocked by the media. Or the liberals and media argue that these difficulties are well-deserved, such as when white farmers in the South protested that they were losing income due to tariff wars. Often the liberals and media made fun of the white conservatives having financial problems, because "they had voted for Trump", so they deserved being victims. As Brakke observes, "A big problem is that the white Americans have legitimately come to see themselves as an endangered, discriminated group," because they are, as a result of attacks by liberals and the media who have shamed and berated them. The strident verbal attacks on them have become a form of bullying. But then that tactic is supported, because the liberals and the media don't recognize white Americans as victims. Instead, they have demonized them and downplayed their complaints about economic losses and losing their way of life as illegitimate. Moreover, when white Americans complain about illegal immigrants, they are accused of being racists. But they do have a real gripe, because they are losing their place and have a declining income in America." That's why, as Brakke says, the problem is exactly as Chua states in the conclusion of her article, "At its core, the problem is simple but fundamental. While black Americans, Asian Americans, Hispanic Americans, Jewish Americans, and many others are allowed -- indeed, encouraged -- to feel solidarity and take pride in their racial or ethnic identity, white Americans have for the last several decades (been told) they must never ever do so." And that, Brakke emphasizes, is not fair. So what's the solution? Brakke says a good starting point is to recognize and respect the legitimacy of the complaints of white Americans. Their complaints should be seen as equally valid as the claims of other groups. Then, with that understanding, there is a need to have discussions, perhaps with representatives of the different groups, and to issue a report to the media. As for what else, Brakke is working up a program of specific actions that can be taken by the government, the media, and different political groups to bring everyone together again. Brakke also points out how these divisions developed which led to this increasing tribalism based on race, ethnicity, gender, religion, and other characteristics, in his forthcoming book Fractured America. A chapter on this topic is also included in his recently published Crime in America. In writing his books and in working as a consultant, Brakke brings to the table a unique conservative approach to crime, criminal justice, and American society. That's because usually liberals discuss ways to reform the system through more of a social welfare approach. But Brakke's approach is based on an economic business model of doing what works most efficiently to both cut down costs and create more productive citizens. To learn more, you can get a copy of Fractured America when it is released and in Crime in America, with a chapter on these divisions in America. Both books are available through Amazon, Kindle, and major bookstores. Crime in America is currently available on Kindle at reduced price during its special KDP Select Promotion at https://www.amazon.com/Crime-America-Conservatives-Approaches-Criminals-ebook/dp/B07MKZG84Z. Also, free copies are available for government officials who are seeking ways to reduce crime and fix the criminal justice system and for members of the media at www.crimeinamericathebook.com. Fractured America will be published in early February.